Same sire as NIGHTS WATCH & RISING RED. Owners can start dreaming about Thousand Guineas and Oaks if they take up a supreme opportunity to get involved with the ownership of this filly by NZ-based sire REDWOOD. The REDWOOD stock has done a terrific job with the stakes winner ROMANCER and a near-miss in an NZ Derby with Rising Red, who went on to run 2nd in the G3 Naturalism Stakes which was won by yet another Redwood progeny in NIGHTS WATCH. Rosewood and Swampland have also impressed with stakes placings and the stallion’s stock just thrives over ground. REDWOOD is a son of HIGH CHAPARRAL who was a Listed winner on debut over a mile at Newmarket before winning the Grade 1 Northern Dancer Stakes over a mile and a half (2400m) in Canada. However, Redwood was competitive across the world, running second in the Hong Kong Vase and Sheema Classic in Dubai where he was competitive with the best stayers in the world. He has passed the competitive nature onto his stock. 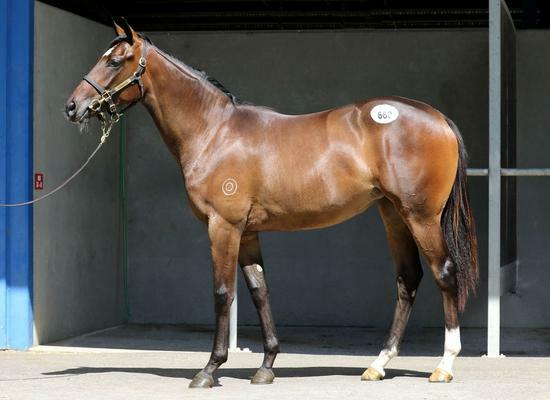 This filly is a daughter of the DARCI BRAHMA mare Darting, who was a 1200m winner in New Zealand that hails from the same family as NZ Group 3 winners ART BEAT, PERFECT START while her pedigree also includes US Grade 1 winner APTOSTAR, Irish Group 3 winner ALEXIOS KOMNENOS and Irish St Leger winner ROYAL DIAMOND. REDWOOD (GB) (Bay or Brown 2006-Stud 2012). 4 wins-1 at 2-from 1m to 1½m, Woodbine Northern Dancer Turf S., Gr.1. Sire of 89 rnrs, 40 wnrs, inc. SW Night's Watch (MRC Naturalism S., Gr.3), Rising Red, Romancer, SP Rosewood, Swampland, High Mode and of Livin' on a Prayer, The Heiress, Big Sur, Chamalu, High Sierra, I See Red, Red Sierra, Suliman, Tamarack, Woodloveto, Dashper, Haylin Rouge, Rock on Wood, Cedar Grande, Dr Hank, Metasequoia, etc. DARTING, by Darci Brahma. 2 wins at 1200m, 1400m, 2d ARC Maserati H., Counties RC Manurewa Cosmopolitan Club H. Half-sister to ART BEAT, PERFECT START, Smartly. This is her first foal. ART BEAT (Captain Rio). 9 wins from 1200m to 1600m, NZ$219,450, CJC Winter Cup, Gr.3, BOP RC Tauranga Classic, L, Rotorua RC Lion Red P., L, ARC Life Education Ambassador Terenzo Bozzone H., Newmarket Rotary Club H., Swiss Deli H., Te Hana Sparkling H., 2d Rangitikei Gold Cup, L, 3d Rotorua S., L, Matamata RC Rich Hill 3YO H., 4th Taranaki RC Opunake Cup, L, Counties RC Karaka Classic, L.
PERFECT START (Perfectly Ready). 8 wins from 1200m to 2300m, NZ$364,850, A$3,500, Manawatu Cup, Gr.3, WRC Trentham S., Gr.3, Taranaki RC New Zealand Bloodstock Leasing & Finance H., ARC Active Electrical Suppliers Mile H., Manawatu Cup, ARC Lindauer Mile H., Dunstan Feeds Qualifier, 2d Wellington Cup, Gr.2, CJC New Zealand Cup, Gr.3, Otaki Maori RC Hunting & Fishing Otaki H., Taranaki RC ITM Interprovincial Challenge H., Seaton Park H., 3d Wellington Cup, Gr.3, ARC Soliloquy S., L, Feilding JC Anzac H., L, ARC Mitchelson Cup, Rotorua RC Fiber Fresh 3YO H., 4th CJC Canterbury Breeders S., Gr.3, Taumarunui Cup, L.
Smartly (Fast 'n' Famous). 6 wins from 1200m to 2400m, NZ$179,250, ARC Celebrating Petty Cury H., Whangarei Cup, Waikato RC Jen Campin Racing Stayers Cup, BOP RC Bayleys Real Estate H., Rotorua RC Escape to Rydges H., 2d Marton Cup, L, Rotorua Challenge P., L, Taranaki RC New Zealand Bloodstock Leasing & Finance H., Manawatu Cup Prelude, Taupo Cup, ARC Ernst & Young H., 3d Rotorua Challenge P., L, Taranaki RC ITM Interprovincial H., 4th BOP RC Japan-New Zealand International Trophy, Gr.2, Counties RC Karaka Classic, L, Rotorua Challenge P., L.
Darting. 2 wins. See above. Martini Lass. Winner at 1600m in NZ. Total Response (Kheleyf). 3 wins from 1200m to 1600m, ARC Eagle Magic Fishing Charters Mile, 2d BRC Canadian Club H., 3d Waikato RC Star Way S., L.
Silent Song. 4 wins to 1400m, A$207,400, QTC Laminex Group H., AJC Oxinium H., Theo Green H., 2d AJC Young Members Spring Luncheon H., Dot It at Diggers H., STC Guildford Leagues Club H., Harvey Norman H., Ronald Coles Investment Art H., 3d BTC National Pub Poker League Quality H., AJC Safilo Eyewear H. Producer. Closet Rocker. Winner at 1200m, STC IGA Mosman P., 2d STC Crowne Plaza Terrigal 2YO H., 3d City Tatt's RC Omega 2YO P., STC Country Week Show P., Golden Slipper Day 2YO P. Producer. Colossal (Grand Lodge). 5 wins-1 at 2-at 1500m, 1600m in Ireland and Macau, Macau Ashburton H., 2d Macau Spring Trophy, L, 4th Macau Guineas, L.
ALEXIOS KOMNENOS (Choisir). 2 wins-1 at 2-at 7f, 1m to 2017, Leopardstown Desmond S., Gr.3, Curragh Barronstown Stud 2YO S., 2d Leopardstown Tyros S., Gr.3, 3d Curragh Celebration S., L.
ROYAL DIAMOND (King's Best). 9 wins at 1¾m, 2m, £201,942, €262,195, Irish St Leger, Gr.1, Ascot British Champions Long Distance Cup, Gr.3, Curragh Irish St Leger Trial, Gr.3, Leopardstown Challenge S., L, Leap on Facebook H., Sandown Drivers Jonas Won't Wait H., 2d Curragh Irish St Leger Trial S., Gr.3, Leopardstown Ballyroan S., Gr.3, Curragh Cup, Gr.3, Navan Vintage Crop S., Gr.3, York Ebor H., 3d Yorkshire Cup, Gr.2. PRINCESS HIGHWAY (Street Cry). Joint Champion 3YO Filly in GB in 2012 (Long). 3 wins at 1¼m, 1½m, £77,092, €104,045, US$408, Royal Ascot Ribblesdale S., Gr.2, Naas Blue Wind S., Gr.3, Leopardstown Irish Stallion Farms Fillies S., 3d Irish Oaks, Gr.1, Naas Blue Wind S., Gr.3. Producer. MAD ABOUT YOU (Indian Ridge). 3 wins-1 at 2-at 7f, 1m, €337,985, US$7,500, Curragh Gladness S., Gr.3, 2d Curragh Pretty Polly S., Gr.1, Irish One Thousand Guineas, Gr.1, 3d Curragh Moyglare Stud S., Gr.1. Producer. ROSE DE PIERRE (Dubawi). 4 wins at 1m, €115,880, to 2017, Leopardstown Heritage S., L, 2d Naas Athasi S., Gr.3. CARLA BIANCA (Dansili). Champion Older Female in Ireland in 2015 (Long). 5 wins from 9f to 1¼m, €189,515, US$13,580, Curragh Dance Design S., Gr.3, Leopardstown Meld S., Gr.3, 2d Cork Munster Oaks, Gr.3, Dundalk Diamond S., Gr.3. JOAILLIERE (Dubawi). Champion Older Mare in Germany in 2016 (Sprint). 2 wins at 1400m in Ireland and Germany, Dortmund German Owners' and Breeders' Sprint Trophy, L, 2d Tipperary Concorde S., Gr.3. MAKING LIGHT (Tamayuz). 5 wins-2 at 2-from 7f to 1m, €187,940, to 2018, Leopardstown Killavullan S., Gr.3, Naas Park Express S., Gr.3, 3d Curragh Ridgewood Pearl S., Gr.2, Naas Gladness S., Gr.3.